eatOkra is the first smartphone application to focus solely on black-owned restaurants and food establishments in the United States. Users can access a growing list of black, Caribbean, and African-inspired restaurants in a simple to use way that includes directions, rating options, and the ability to add a business via the mobile app or website. eatOkra is what The Green Book Guide was to black travelers during the 40s, 50s and 60s. The mobile app enables black travelers to identify and locate and support black food and hospitality businesses that are safe and friendly. 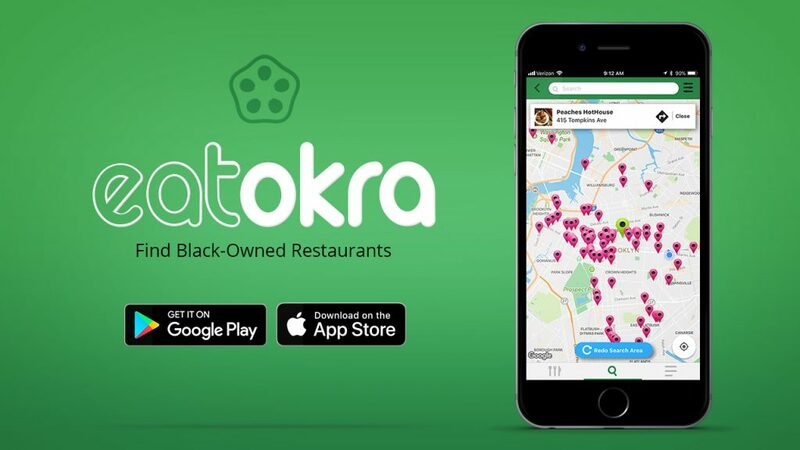 JULY 2018 – BROOKLYN – Mobile app eatOkra is the first smartphone application to curate over 800 black-owned restaurants and food establishments throughout the United States. Developed by military veteran, Anthony Edwards, Jr., _eatOkra_ is the result of wanting to locate restaurants in his Brooklyn neighborhood and becoming astonished by the variety of black-owned food establishments he discovered. “I was curious and started researching restaurants all over New York City and the boroughs, which led me to research other major cities as well,” said Edwards. Realizing that there was no one place online that listed them by city or state, the web developer built an application for both iOS and Android users. The initial group of businesses was manually entered by Edwards, his business partners Janique Bradley and Justin Johnson. Ultimately, friends, black chefs and restaurant owners added to the listing that also includes restaurants featuring cuisines from Africa, South America, and the Caribbean. The first version of eatOkra was soft-launched in 2016 with Edwards’ continuous effort to enhance user-experience. To date, there have been almost 1,000 downloads by users seeking restaurants, coffee houses, and food-related events such as pop-ups and food trucks in 15 major cities and the District of Columbia. Users can add businesses from the app or website. The organic growth of the app’s users has enabled the team to analyze and track downloads based on current events. Edwards found a direct correlation between a recent increase and racially-charged events at a Philadelphia Starbucks and an Alabama Waffle House. EatOkra is a bootstrapped venture but Edwards and his partners have a business model that includes an advanced web-based application and paid options as well as strategic partnerships. “We want to offer more consumer-specific services, especially those services that assist in locating food places and events in their travels or at home while also serving those food businesses,” said Edwards. EatOkra is your simple guide to finding black-owned restaurants.